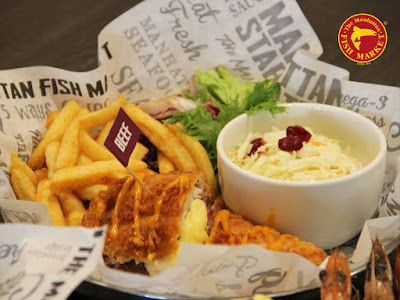 If you’re looking for a place for you to be together-gether with your family in this holy month of Ramadhan, Manhattan Fish Market is the right one! There’s Ramadan special offer and promotions in here too! The Big Bang Family Platters gives delectable choices of different meats and sides for your family and friends to enjoy it together. With the starting price from just RM63.94 (Don’t worry, GST is included.) who would refuse to give it a try? The price is so much worth with its size! 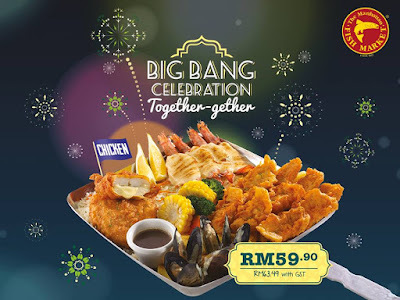 Some of you might be familiar with MFM’s Fishy Chicky Bang Bang Platter, but MFM does something different for this Ramadhan by introducing Fishy Lamby (lamb) Bang Bang platter and Fishy Mooo-it (beef) Big Bang platter specially for you! The amazing thing is, it comes with succulent fish fillets combined with chicken, lamb or beef through the superb-ness of melted cheddar cheese! I know you’re tempted already. Who would say no if it is served upon a bed of fluffy garlic herb rice and sides of MFM’s chippy chips, garlic herb mussels and Manhattan flaming prawns, fried calamari, and fresh vegetables that are flambéed at the table! (it’s so cool as if like you’re watching a personal performance). If you’re a stay home person, there’s a special add-on for you where you can take home the Big Bang Family Platter for only RM31.80! and it includes two coleslaws, two soups of the day as well as iced teas or fizzies. It’s more than worth it! You think it’s too much and worry your belly might bloat out? Chillax because It also comes with ala – carte for only RM 22.15 each! This is definitely not ordinary ala- carte as it comes with a side of chippy chips and a sunny side up egg lied on a fried spaghetti bed for Fishy Chicky. As for Fishy Mooo-it and Fishy Lamb both come with chippy chips and coleslaw. Yummy nummy fantastic! You can put extra ‘Bang’ by choosing whether you want a piece of Fishy Chicky, Fishy Lamby or Fishy Mooo for only RM 11.55! If you want more, you can add on one set of coleslaw, soup and fizzy or iced tea for only RM 6.25! (You can slurp these two and falling headlong as it serves endless bottomless). If you have lost some ideas for a starter and dessert, don’t worry! You can just add on their awesome onion glory, oyster roulette or sizzling brownie with ice cream. It's totally a big loss to you if you miss all these great offers during month of Ramadhan. What are you looking at? Bang your mouth by visiting The Manhanttan Fish Market website of Facebook page. Be careful, your mouth might water!